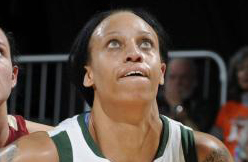 The Minnesota Lynx today announced the signing of center Shawnice “Pepper” Wilson from the University of Miami. In 32 contests last season, Wilson, a 6-6 center from Pittsburgh, Pa., averaged career-highs in both points (10.0 ppg) and rebounds (8.6 rpg) as a senior with the Hurricanes. She finished the year ranking fourth in the ACC free throw percentage (.798), fifth in rebounding (8.6), sixth in offensive rebounds (3.2) and seventh in field goal percentage (.519). Wilson was named the ACC Player of the Week for the first time in her career on March 4, averaging 13.5 points and 10.0 rebounds during the regular season’s last week as the Hurricanes upset No. 4 ranked Duke. The 15th season of professional women’s basketball in Minnesota kicks off Saturday, June 1 at 7 p.m. when the Lynx take on the Connecticut Sun. The first chance fans have to see the defending Western Conference champions is the team’s preseason contest at Target Center on Tuesday, May 21 at 12 p.m. Beginning as low as $18 per game or $187 for a full season package, fans can purchase tickets by calling the Lynx at 612-673-8400 or by visiting LynxBasketball.com/LynxTix.